Including; GPS icons to locate toilets which includes facilities and address, Google-style map, database integration. A major problem in the City of London is the lack of public conveniences; the City of London Corporation who manages the Square Mile devised a scheme where members of the public could use retail outlets, pubs and restaurants free of charge. 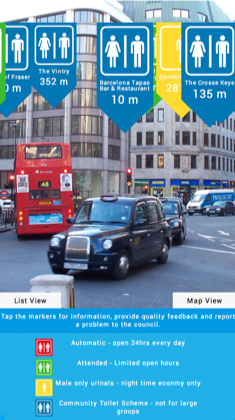 We have developed an Augmented Reality feature which overlays GPS markers over the scene being viewed through the mobile device’s screen, indicating the toilets location and facilities. The App auto-updates at 2am every night, adjusting opening times, or if an establishment is closed for refurbishment etc. then members of the public are not sent to an unusable loo. When in the City of London, with the App running you simply hold your mobile device up in front of you and the icons show the direction to walk in. Keep the icon in the centre of your screen and watch the distance countdown until you reach the toilet’s location. Since it’s launch mid-April 2015 the app has been downloaded by 12,718 unique users, most are single use visitors – we think this is due to having once located a toilet you do not need to use the app again. 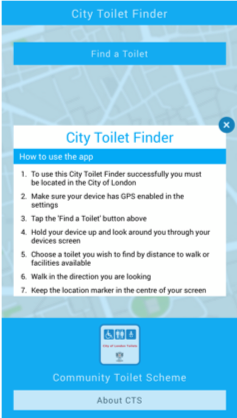 The City Toilet Finder is free to download and is available for both iOS and Android devices – please search for City Toilet Finder in the Apple Store or Google Play.